I can remember at high school being late for a class and telling the teacher “better late than never” (cheeky bugger me) and he replied “better never late”. Well, for Easter I had planned to do a recipe post on hot cross buns, but the next thing I knew it was April already, and I was LATE. And then, The Little Loaf set this month’s Fresh From The Oven challenge and it was for Hot Cross Buns. So, now I had to make them! But I knew I could not get the post done in time for Easter as the first free moment I would have to bake would be on Easter Friday. We were going out for lunch and I knew that they would make a welcome dessert, especially as they would be freshly made. We did a taste test, comparing them to ones made in a bakery, and mine were judged to be the best! They are spicy, and easy to make, and the recipe I am sharing with you is straight out of the book for my bread maker. The starry tops are so pretty. Thank you for taking part this month. I love the star on top and also the addition os cranberries sound good too. I was so lucky that Dave toasted them for me all weekend long! You did make them! Awesome.. love the cranberries and that you did little pretty stars on top!! I love how yours look! They do look like snowflakes on top. I think they are so worth it and not that much trouble really. These look great! I still haven’t made mine for FFTO this month – hopefully I’ll be able to find time! Tandy its never too late for hot cross buns. I’d eat them in november! My favorites – these look beautiful! That sounds perfect! I love when you can make big batches of food that are still good a few days later–some breads really don’t age well, and it’s sad to put in all the work to bake, and then have it last a day. They look wonderful, you did a great job., I don´t know why I got into such a tangle with mine…next year I´m going to take some tips from my fellow bloggers! Beautiful recipe for hot cross buns Tandy! 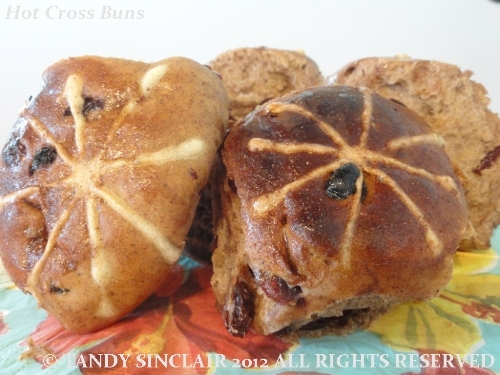 I could enjoy hot cross buns all year around – I shall leave off the crosses and call them spiced buns. I’m with you! I did mine twice!! One on Easter and the other on Good Friday! It takes me a long time to blog… So I already knew my post would not have made it on Easter… But hey!! Who’s to say you can’t bake on non-easter days? hehehe.. Lovely looking buns! I LOVE hot cross buns. Many years agol a friend who had never baked with yeast asked me, so we made them at my flat. We ate them ALL hot from the oven and both suffered serious pain from all that fresh yeasty bread. I’ve never tried since.